We’ve been carrying the finishing products of H. Behlen & Bros. for many years. I personally have been using Behlen products since I was a kid living with my parents. Behlen is a grand old company and brand that has been around for ages (its origins date way back to 1888). But times they are a ’changing. Some time ago Behlen was taken over by RPM, a company that also owns Mohawk finishing. We just learned that RPM plans to close Behlen and fold it into the Mohawk line. Our first reaction was to place a large order and stock up - particularly on Jet Spray aerosol lacquer, which some customers buy by the case. (As one customer once told us, “The guy finishing my chairs disappeared after the down payment, but he left me with his secret recipe of Jet Spray.” Then she bought 2 cases.) Some of our luthier customers are especially devoted to the Vinyl Sealer and Stringed Instrument Lacquer Aerosol. So we don’t want to disappoint. At this point we should be able to handle Behlen orders for a little while -- other than the DVDs, of which we have just one. What happens when we run out? Our Behlen rep said that Mohawk already offers some of the same products and we could transfer over to the Mohawk line. But several issues are giving us pause. Mohawk finishes are mass market items. There is no relationship with a maker, just margins based upon volume. We can’t compete with the discounts Amazon gets. And Mohawk will cost more than Behlen -- even for what we are told is literally the same product. We’ll also have the nuisance of changing the products’ names, photos, codes, etc. All of these factors have unintentionally introduced time for reflection: do we want to go this route? Increasingly we don’t. Perhaps it's because so many of our in-store customers describe their workshops tucked into a corner of their apartments, or bring their adorable dogs with them when they shop --- in any event, we are really aware that finishing sometimes takes place in the company of living things, without much ventilation. This makes us want to move away from aerosol nitrocellulose and toward finishing products that are less toxic to people, pets and plants. And it is not just us. Most of our customers are small shops that don’t have big-time spray booths or individuals working in their homes or tight, shared workshops. Ventilation can be iffy. We’re all for fitted respirators with frequently replaced cartridges and nitrile gloves and the like if you’re going to go the standard finishing route. But how about skipping the toxicity in the first place? More and more of our customers want non-toxic finishes: finishes that are safe to apply and don’t have toxic out-gassing or residue. Increasingly there are very good alternatives. Some options: BT&C flake shellac (made for us by hardworking Lac beetles); Osmo hardwax (oils like sunflower and soy with carnauba and candelilla waxes, Tung Oil (oil squeezed from the seed from the nuts of the Tung tree); finishing creams (wax and very fine abrasive) and soft waxes from Real Milk Paint. And earth pigments (fine natural powders) from Liberon and milk paint (milk) from Real Milk Paint for color. 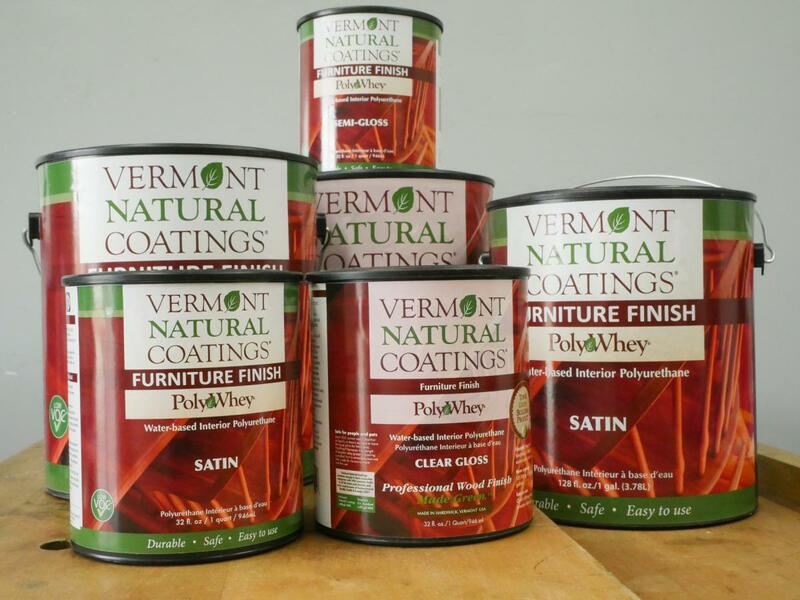 We just added lots of non-toxic, low VOC products from Vermont Natural Coatings, which uses byproducts from the Vermont dairy industry for its PolyWhey Furniture Finish and other finishes. And very soon we will start carrying the fabled Tried & True line (linseed oil). Are the Vermont Natural Coatings, PolyWhey in particular, intended for both indoor and outdoor use? Vermont Natural Coatings does make exterior products however the products we are currently stocking are for furniture, flooring and other interior woodwork. Great that your thinking non- toxic. But how does the product finish? Is it as good or better than the old products (toxic)? Finishing is highly subjective. We have customers who would rather use OSMO than anything else because of the way it looks. PolyWhey is new to us but we like it and we added it because of customer requests. Shellac has always been in demand, and a true French polish, which is a lot of work - is the finest finish I have ever seen of any kind. Personally I love oil finishes topped with wax. Be aware, they said that this product does not fade yellowish. Prior to usage I emailed and asked that question and was told it doesn't fade yellowish. I put this product on over a white latex set of painted kitchen cabinets. Within months the cabinets looked yellowish. I ended up having to refinish the cabinets by painting again. So be aware how you use it. Afterwards I even emailed them but did not receive any satisfactory answers about their products effect onto of paint. I've started using Tried and True Varnish Oil because spraying is out of the question. So far results are pretty good and it's incredibly easy to apply. Mohawk makes some nice padding lacquers (Lacover, Lac French) that are easy to apply, after some practice, and give a beautiful gloss. It's still nitrocellulose & lacquer thinner, but not launched into the air with your sprayer or aerosol can. Behlen and Mohawk aren’t the only game in town you know. Go talk to the guys at Masters Magic. Thanks, Joel. I’m one of those apartment woodworkers, and I’m happy that TFWW stocks such a variety of non- and less-toxic finishes. Woodworking is a way for me to relax after a day at work, and what’s relaxing about VOCs? I've used the Vermont Poly Whey for cabinet interiors and shelves. It gives a good semi-gloss finish. I think this is a timely move, as more and more of my woodworking colleagues have moved to less toxic finishes, both the commercial as well as the hobby guys. Obviously two different games economically and time wise, but good options for both, just requires a bit of rethinking how we approach finishing. I always assumed Behlen and Mohawk were the same product in different cans. I can understand why you are moving toward more eco-friendly options. personally I can’t use them because my customers demand durable products. I think it's a good move. I don't like the toxic either, especially when it comes time to get rid of any left overs. Requires a special trip on a weekend to the toxic waste center to be rid of it properly. Depends on the wood but my favorite interior wood finish is a personal blend of linseed oil, tung oil, and thinner topped with a few coats of shellac (made from flakes.) Put that on a piece of figured maple and the grain will pop and the texture is soft to the touch. I've been using PolyWhey for years and I absolutley love it. While no finish is foolproof, I've found it to be quite user friendly applied by pad, foam brush, synthetic bristle brush, and HVLP. The VOC's are miniscule, to the point I don't wear a respirator unless spraying it. It's durable, flexible, and sticks to almost anything. It's good to see Vermont Natural Coatings get greater recognition. I had been using oil based and lacquer finishes for years when I had a dedicated building. Eight years ago we moved and my shop is in a basement/garage space of my house. I switched to straight shellac, Zinnser sprayed with hvlp. Ten coats and rubbed out to a satin finish. Dries fast and no lingering odor at all. The only petro solvent based thing left in my process is paste wax and Scotch 77(and I’d be grateful for a green substitute).